River systems host a hidden world of tiny invertebrates. Some are microscopic, while others, though visible to the naked eye, remain unseen unless a curious fisherman cuts open the stomach of his catch. A fish’s stomach might contain small crustaceans including water fleas (Cladocera), seed shrimp (Ostracada), amphipods, copepods and/or isopods. These minute shrimp-like creatures form the basis of a food chain that supports fish populations. Seed shrimp (Ostracods) along with other small crustaceans are an important part of the food chain in aquatic habitats. In southeastern North America rivers overflow their banks between November and March because cooler temperatures reduce evapotranspiration and dormant riverside vegetation takes in less water. The flood stage is especially wide in the flat coastal plain region where a sheet of water 2-3 feet deep can cover hundreds of square miles alongside major rivers, though modern dams, ditches, and canals have reduced the former extent of these flooded wetlands. This flooded land offers more territory for fish to forage and reproduce. The diet of many fish species changes from the aquatic crustaceans mentioned above to prey that normally lives some distance from the river. 1 study found fish occupying floodplains ate a species of isopod that lives in small pools of water, terrestrial species of crayfish, beetle larva, and caterpillars. These terrestrial species were not normally found in fish’s stomachs until the flood stage. Some species of fish even breed over floodplains that become dry land during summer. The blueback herring (Alosa aetivalis) spawns in flooded hardwood swamps, unlike its relatives the American shad and hickory shad that spawn in the main channel and tributaries of a river. Blueback herring eggs adhere to twigs on the forest floor. Blueback herring spawn over flooded land. White bass (Morone chrysops) also spawn on floodplains during high water. This species is probably the “white fish” mentioned by John Lawson in his book A New Voyage to the Carolinas. A few years ago, I wrote a blog article identifying the fish Lawson wrote about in his early natural history book. (See: https://markgelbart.wordpress.com/2014/08/31/identifying-the-species-of-fish-described-by-john-lawson-in-1710-part-2/ )I was able to figure the identity of most of them despite the archaic names and vague descriptions, but his “white fish” stumped me. Zach Matthews, editor of The Itinerant Angler, suggested to me that Lawson was referring to the white bass. Lawson’s description that it was found in “freshets” or floodwaters is good evidence he was discussing the white bass. White bass also spawn over floodplains. This is probably the “white fish” John Lawson discussed in his book A New Voyage to the Carolinas. There have been plenty of genetic studies of the white bass and its cousin the striped bass because the 2 closely related species are hybridized for sports fishermen. But I can’t find any genetic studies that explore the evolutionary origin of this genus. It seems likely white bass diverged from the same ancestor as the striped bass, and this common ancestor was probably an anadromous fish, like the latter species. The initial ancestral population of white bass began spawning on floodplains and became landlocked and unable to return to the ocean when something temporarily blocked access to the ocean. This explains how the 2 species diverged from each other. White bass evolved the ability to survive entirely in freshwater habitats and were able to colonize aquatic environments much further inland than striped bass. White bass collect fat reserves and can endure cold winters. They became well adapted to the colder temperatures of Pleistocene Ice Ages. Geneticists could probably use a molecular clock to determine when this divergence occurred, and they may be able to tie the timing to some climatic event. Fish use floodplains to migrate to new habitats and maintain genetic vigor between populations. During flood stages many fish from the Okefenokee Swamp swim through flooded habitat to the Suwannee River. Warmouth, flier, bowfin, pickerel, bullheads, and lake chubsuckers have all been recorded traveling through 2-3 feet of water to the river. Floods can also connect breeding fish from oxbow lakes with fish from the main branch of the river. Shiners, bream, catfish, darters, mosquito fish, and starhead minnows often travel through flood waters between oxbow lakes and rivers. Eels also use these corridors but they don’t breed in freshwater. Many fish get trapped in oxbow lakes and sloughs after floodwaters recede. However, oxbow lakes provide better habitat for fish than rivers, often holding 12 X more fish per acre though species diversity is identical. The most common fish in Altamaha River oxbow lakes are gizzard shad, spotted sucker fish, and channel catfish. During Ice Ages rivers in the southeast didn’t flood as much as they do today. The fish best adapted for braided river patterns were most common. Cut-off channels within river beds probably held concentrated populations of catfish and killifish. Anadromous fish such as shad and striped bass spawned in areas that have since been inundated by rising sea levels. Following the end of the Ice Age, there was a supermeandering phase of rivers when flooding was more extreme than it is today. This caused a resurgence of floodplain fish species. In my previous blog entry I explained how Pleistocene megafaunal extinction impacted ecosystems, but some scientists hypothesize the loss of megafauna influenced atmospheric conditions as well. The existence of enormous ice caps during Ice Ages caused extremely unstable climate conditions as the below temperature graphs illustrate. The climate alternated between warm phases known as Dansgaard-Oeschger Events and cold phases referred to as Heinrich Events. The onset of these patterns was often sudden occurring within decades, though some cold phases occurred gradually. The fluctuations were interrelated. Dansgaard-Oeschger Events melted glaciers and eventually released too much cold fresh water into oceans, shutting down ocean currents that carried tropically heated water to northern latitudes. Colder oceans caused temperatures on adjacent continental land masses to drop. The Younger Dryas, a cold phase that began 12,900 years ago, was an exaggerated Heinrich Event. Scientists, led by F. A. Smith, a professor at New Mexico University, propose the collapse of megafauna populations in North and South America contributed to the severity of the Younger Dryas stadial. Ice core data from Antarctica illustrates fluctuations in climate over the past 500,000 years. The brief but severe Younger Dryas cold snap can’t be seen on this chart, but supposedly it was an anomaly compared to other fluctuations. Ice core data from Greenland showing fluctuations in climate over the past 23,000 years. Within decades a warming climate phase reversed, and average annual temperatures matched the coldest of the preceding Ice Age. Large populations of megafauna produce immense quantities of manure–a source of methane (CH4), an important greenhouse gas. Megafaunal populations collapsed shortly before the Younger Dryas began, so perhaps without the mitigating effect of this manure-sourced methane temperatures dropped further than they would have, if these animals had still been present in the environment. Moreover, more forest replaced grasslands because there were no megaherbivores suppressing tree regeneration. Trees help reduce CO2, another greenhouse gas. Today, methane produced by increasing populations of livestock combined with deforestation contribute to an increase in greenhouse gas concentration and global warming. Modern day livestock contribute to greenhouse gas emissions. A new hypothesis suggests the extinction of Pleistocene megafauna in North and South America contributed to the severity of the Younger Dryas cold phase when average annual temperatures suddenly plummeted to levels not seen since the Last Glacial Maximum. The entrance of humans into southeastern North America and the subsequent extinction of megafauna species had a profound effect on the region’s ecosystems. Evidence from other regions suggests megafauna populations began to collapse during the Boling/Alerod interstadial, a warm phase of climate following the Glacial Maximum that lasted from ~15,000 years BP-~12,900 years BP. Megafauna populations should have been increasing during this climate phase because the increase in precipitation and warmer temperatures fostered greater plant growth and species composition diversity. However, the improved climatic conditions benefitted people and in turn the presence of humans is almost always disastrous for wildlife. When the men failed on a day’s hunting trip, they still had plenty of food, thanks to the women who gathered wild plant foods and trapped fish, turtles, and birds in their nets all day. The increased precipitation also caused an expansion of wetland habitat and aquatic resources. Under these environmental conditions human populations rose rapidly, much to the detriment of large animals. Within a few thousand years humans wiped out almost all of the large mammal species in the south, so for the first time since a few million years after the KT impact that knocked off the dinosaurs, the region was nearly devoid of large megafauna populations. Few scientists have studied the details of megafauna extinctions in the south and how they impacted the ecosystem. One study (Smith, F.A. 2015 referenced below) looked at all the Pleistocene sub-fossils found in Hall’s Cave, Texas–a site with well dated chronology and a continuous record of mammals from 22,000 years BP to the present. A statistical analysis suggests many Pleistocene mammals were positively associated with other species. This means complex interrelationships between species probably existed, though we have no way of knowing what they were. This blog entry is my attempt, as an educated layman, to imagine what occurred as Pleistocene ecosystems unraveled. I propose the first animals to be overhunted to extinction in the southeast were ground sloths, pampatheres, glyptodonts, and giant tortoises. Ground sloths and pampatheres were important keystone species because they constructed extensive deep burrow systems. (I also believe giant tortoises, like their extant relative the gopher tortoises, dug burrows. Unfortunately, a paleontologist labeled giant tortoises as “non-burrowing” in a 1950’s era paper, and no qualified vertebrate zoologist has ever challenged his assumption. I am unaware of any study of Hesperotestudo anatomy that determined whether they could burrow or not. If they couldn’t dig their own burrows, they must have been dependent upon ground sloth and pampathere burrows.) These burrow systems provided refuge, not only for ground sloths and pampatheres (a kind of giant armadillo) but many other species as well. They served as shelter for hundreds of species of small vertebrates and invertebrates, much like the tunnels of prairie dogs and gopher tortoises do today. I hypothesize ground sloths were immune to snake bite venom because their burrows likely served as winter dens for rattlensakes. Large predators, bears, and peccaries probably used abandoned ground sloth burrows for shelter. Ground sloths excavated large quantities of subsoil too and when mixed with topsoil these mounds supported unique plant communities. It seems likely the plants that grew around ground sloth burrows were edible for ground sloths and many other herbivores. I recently watched an episode of Expeditions with Patrick McMillan that showed a prairie dog town surrounded by mallow flowers. Fossil coprolites indicate globe mallow was a favorite food of 1 species of ground sloth. I doubt ground sloths lived in dense colonies like prairie dogs. I guess there was normally 1 active ground sloth burrow every 3-5 square miles. Intraspecific competition, if it existed in ground sloths, may have limited population density. The burrows helped ground sloths survive climatic extremes, and the large powerful animals were able to hold their own against predators, but they were defenseless against men with projectile weapons. They were the easiest of all the megafauna for men to kill–the most meat from the least effort–and therefore were the first to be hunted into extinction. The increased frequency of fires set by humans may have also contributed to their extinction. Instinct told them to take refuge in their burrows during lightning storms when the flashes of electricity ignited natural fires, but fires set by humans could overcome them at any time of year during sunny conditions. Ground sloths could not outrun fires. All the animals and plants that benefitted or completely depended upon ground sloths, pampatheres, and giant tortoises had to re-adapt to their absence. Photo of a prairie dog colony. Though giant ground sloths and giant tortoises probably didn’t live in dense colonies, they also dug burrows throughout their range and were important keystone species that played as an important role in ecosystems as prairie dogs do today. They were likely the first organisms to be wiped out by humans in North America. The largest most dangerous predators were the next group of animals to be eliminated from the landscape. Giant short-faced bears, giant lions, and fanged cats had no fear of people, yet they were no match for groups of men with projectile weapons. Many of these animals were killed while contesting carcasses with people. The decline of large carnivores likely occurred simultaneously with the extermination of mammoths and mastodons. During the Boling/Alerod interstadial mastodon populations should have been increasing because this semi-aquatic species benefitted from the expansion of wetlands. But humans drove mammoths and mastodons away from their favorite foraging grounds and watering holes, and they disrupted their migration routes. The reproductive rates were too slow to keep up with human hunting pressure. African elephants influence their environment today. In Kruger National Park elephants uproot 1500 mature trees annually. They convert forest into open savannah. Mammoths and mastodons likely kept environments in southeastern North America in a constant state of flux. The environment was patchy with various stages of forest succession located adjacent to other stages–meadow next to shrubby thickets alongside 2nd growth and mature woodland. There were groves of large seeded fruits such as Osage orange, pawpaw, honey locust, and persimmon that had been planted in the excrement of the proboscideans. After mammoths and mastodons were eliminated the patchy woodland and grassland transformed into a monolithic mature forest that supported few large mammals. The loss of patchy habitat hurt populations of llama, peccary, and tapir. Even some small animals disappeared from the region, as their favored micro-environment converted to deep forest. Next came the slaughter of horses and bison. With mammoths and mastodons gone, the final populations of horses in southeastern North America were hemmed into smaller grasslands because forests expanded now that trees weren’t being uprooted with the same frequency. This made them more vulnerable to human hunters. 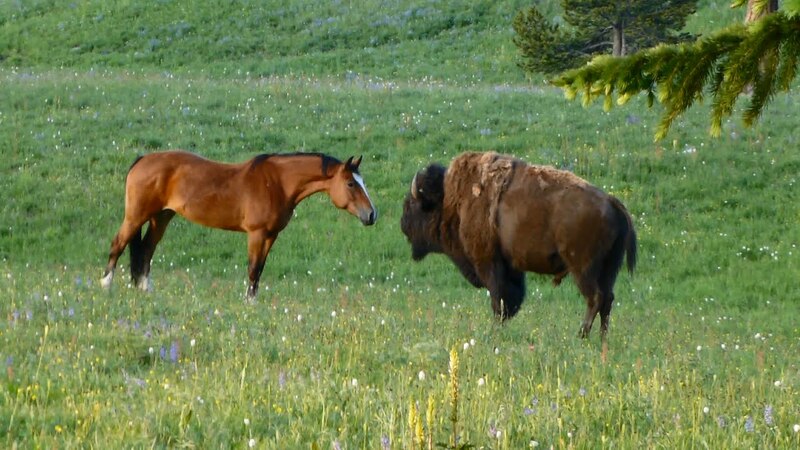 Bison benefitted from their co-existence with horses. Bison feed on the nutritious new growth spurred by horses grazing tall grass. But the elimination of horses also meant bison, those that avoided human hunters, had a hard time surviving in the region. Pleistocene horses may have improved the quality of grazing for bison. The loss of megafauna spelled the end of the line for a long list of commensal species including condors, and extinct species of vultures, eagles, storks, and cowbirds. There wasn’t enough prey for dire wolves and even extinct subspecies of jaguars and cougars. Genetic evidence suggests all North American cougars descend from a population originating in South America 10,000 years ago. Eventually, cougars recolonized the region, probably from a population that evolved a tendency to avoid man and prey on small game as well as deer. And after European diseases decimated Indian populations, bison, and horses introduced by the Spanish recolonized the region as well. The corridor along the Altamaha River drainage is the best remaining wilderness in Georgia. The land here is protected by 11 state wildlife management areas and 2 private landowners. The Nature Conservancy owns Moody Forest, and the Orianne Indigo Snake Society owns land that hosts the greatest variety of reptiles and amphibians in the state. Scientists have recently begun studying this largely undeveloped corridor. From 2008-2016 scientists conducted the first comprehensive survey of reptiles and amphibians along this river system. They used intensive group searches, turtle traps, and drift fences to find species; and they listened for frog calls. Drift fences are barriers interspersed with pitfall traps. Smaller reptiles and amphibians attempt to go around the barriers and fall into the traps. Surveyors collected an astonishing 100 species, indicating the region has the richest diversity of reptile and amphibian species in the state. Fort Stewart army base ranks 2nd with 97 species, and the Okefenokee Swamp hosts 88 species. Map of the Altamaha River Drainage. The Altamaha is fed by 3 major tributaries–the Oconee, Ocmulgee, and Ohoopee. Scientists catalogued 59 species of reptiles and 41 species of amphibians along the Altamaha River. This number includes 17 species that are considered endangered by the federal and/or state governments, including indigo snake, diamondback rattlesnake, southern hog-nosed snake, rainbow snake, harlequin coral snake, pine snake, pine woods litter snake, slender glass lizard, mole skink, gopher tortoise, spotted turtle, southern dusky salamander, and gopher frog. Surprisingly, cottonmouth water moccasins were found at less than half the sites surveyed, and they were absent from the main branch of the river. The authors of this study suggest regular flooding “scours” riverside vegetation, eliminating the cover favored by the venomous snakes. On the other hand river cooters (Pseudemys concinna) were found to be abundant in the river, though according to the preceding scientific literature they were not known to be present here. River cooters are common in the main branch of the Altamaha River. Before the below referenced survey was conducted, reptiles and amphibians along this river were so little studied, this species was unrecorded in the scientific literature as living in the river. 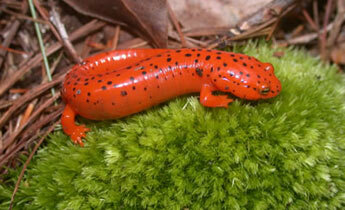 Red salamanders (Pseudotriton ruber) reach the southeasternmost limit of their range at the Altamaha River. This waterway is a geographical barrier for 14 species of reptiles and amphibians. 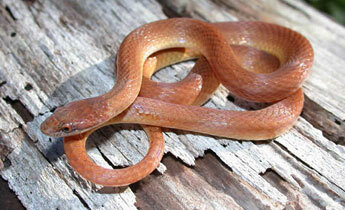 The pine woods litter snake (Rhadinia flavilata) reaches the northern limit of its range at the Altamaha River. This species grows to about 1 foot in length and mostly lives underground. They are venomous but have rear fangs that are probably unable to break human skin. They feed on small reptiles and amphibians and are no danger to people. The reason such a high diversity of species occurs along the Altamaha River is the great variety of habitats. The corridor hosts open water, bottomland hardwoods, cypress/tupelo swamps, longleaf pine savannahs, sandhills, Carolina Bays, and muddy seepage areas at the bottom of north-facing slopes. However, the river itself serves as a barrier blocking movement of some species’ populations. The Altamaha River is the southeasternmost range limit for 13 species, and the northernmost range limit for 1 species.
) Like the black prairie region of Alabama, the Altamaha river also undoubtedly served as a refuge for species of reptiles whose current range was obliterated by an ice sheet during Ice Ages. 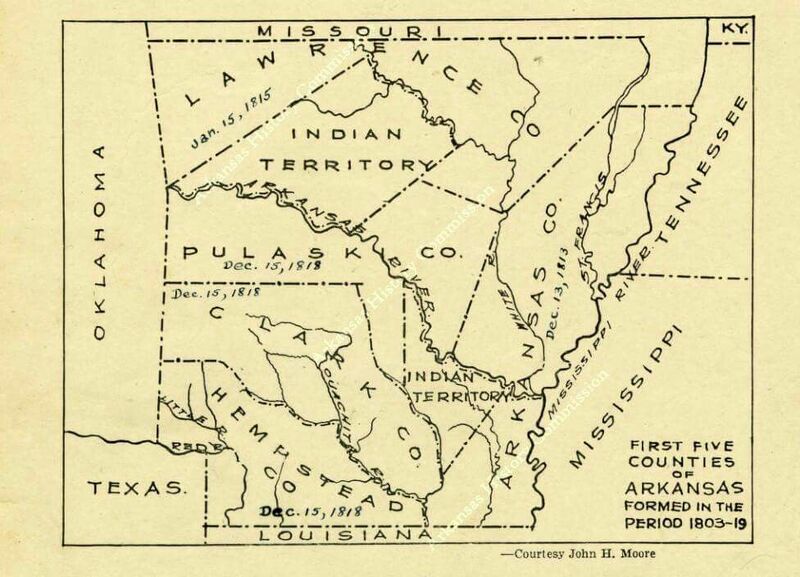 Blanding’s and wood turtles may have extended their range this far south then. Extinct giant tortoises (Hesperotestudo crassicutata and H. incisa) likely lived alongside their smaller cousin, the gopher tortoise. But otherwise the modern species list of reptiles and amphibians in the region is mostly unchanged from the Pleistocene. Buffalo chicken wings exploded in popularity when the Buffalo Bills kept losing Super Bowls almost 30 years ago. The meaty spicy snacks are the perfect drinking party food. The heat makes a drinker thirsty, yet the fat and protein slow down absorption of alcohol. The chicken wings are fried, then tossed in a sauce made of butter or margarine mixed with hot pepper vinegar. Supposedly, Buffalo wings were invented by Teressa Bellissimo at Anchor Bar in Buffalo, New York during 1964. However, Anchor Bar didn’t serve Buffalo wings until 1974. Instead, credit for inventing the dish should probably go to John Young, a native of Alabama, who moved to Buffalo and made spicy chicken wings during 1964. He seems the more likely originator of the dish because Buffalo wings resemble the kind of Cajun or soul food cooking that might be found in south Alabama. Cajun and soul food cuisine make excellent use of throw away ingredients. Before the wing craze they were considered a disposable part of the bird. 2 stinkpot (aka musk turtles) mating in Woodbridge Lake, Evans, Georgia. Scientists discovered they prefer Buffalo chicken wings over any other bait. Buffalo wings–favorite bait of the stinkpot turtle. Musk turtles (also known as stinkpots because of their smelly defense glands) like to eat Buffalo chicken wings. Scientists studying musk turtles at Comal Springs, Texas compared the effectiveness of various kinds of baits. Musk turtles greatly prefer Buffalo chicken wings over fried chicken, raw chicken, catfish stink bait, cat food, potted meat, and canned sardines in oil. The experiment took place in 2 phases. Phase 1 compared Buffalo chicken against the non-chicken baits. Phase 2 compared the Buffalo wings against fried and raw chicken. Scientists captured 231 musk turtles using Buffalo wings compared to just 45 using stink bait, cat food, potted meat, and sardines. Scientists captured 46 musk turtles using Buffalo wings vs 16 with fried chicken and 10 with raw chicken. Musk turtles, like people, are attracted to grease and spice. Turtles agree: they taste better than their natural diet of crayfish, snails, clams, tadpoles, and insects. I write an irregular series on my blog imagining what my life would be like, if I traveled back in time to live in an homestead I established at a location in Georgia 36,000 years ago. (See: https://markgelbart.wordpress.com/category/if-i-could-live-during-the-pleistocene/ ) I don’t like roughing it, so I brought many modern conveniences with me in my time machine including a professional well-digging rig. My Pleistocene homestead in located 1 mile north of the Broad River and 2 miles west of the Savannah, but boring a well would be much easier than building a pipeline from the nearest creek or river. My drinking water well was dug well away from my poultry yards and cow pasture, thus avoiding microbial contamination. I also dug another well to irrigate my crop fields during droughts. The water table was lower during the Ice Age, but I chose to live during a relatively warm climate phase within the Ice Age known as an interstadial, and the water table isn’t as low as it was and will be during stadials when glacial advances lock up so much atmospheric moisture. Nevertheless, I still had to drill deeper to reach water than if I was digging a well during modern times. There is more water underneath the earth’s surface than in all the world’s freshwater lakes and rivers combined. Subterranean water, or ground water, is what I tapped when I dug my wells. Ground water exists in aquifers. There are 2 types of aquifers. Water trapped between rocks under pressure is known as an artesian aquifer. A well tapping into an artesian aquifer doesn’t need a pump because the natural pressure forces the water to the surface through the well. Unfortunately, the aquifer I tapped into is the other kind (an unconfined aquifer), and it requires a pump to bring the water to the surface. I installed an electric pump and have a manual hand pump in case it breaks down. Diagram of the water table. I would bring professional well digging equipment back in time with me, so I could have a convenient supply of water. Animals live in aquifers. Biologists use the term, stygofauna, to refer to this underground aquatic life. Worldwide, there are 170 species of cave fish, and they live alongside salamanders, crayfish, tubellarians, isopods, amphipods, and decapods. Species considered stygofauna share many traits that make them well adapted to live in these dark sterile environments. They are blind and have slow metabolisms, so they don’t require much food. Some are long lived–1 species of crayfish lives an estimated 100 years. Several species of cave fish live in Georgia’s aquifers, and there are probably undiscovered species hidden deep underground. Alabama cave fish. A poorly known ecosystem exists in groundwater. Well water tastes good and is nutritious because it contains dissolved minerals such as magnesium and calcium. But this “hard” water doesn’t suit all of my needs. It leaves stains in the bath tub, a filmy residue on dishes, and it makes my hair feel stiff. For bathing and washing clothes, I collect rainwater in an underground cistern located next to my house. Rain water is considered “soft” because it doesn’t have dissolved minerals in it–just sodium ions. Numerous gutters lead to the opening of the cistern to help keep the cistern full, and I add chlorine to this water to keep it sanitary. A screen keeps detritus from entering the cistern. Keeping the screen clean is a frequent chore. An electric pump draws the water into a solar-powered water heater, and I enjoy hot showers. Diagram of a rainwater cistern. I would use this water for the washing machine and showers because hard water is bad for clothes and washing hair. You are currently browsing the GeorgiaBeforePeople blog archives for July, 2017.